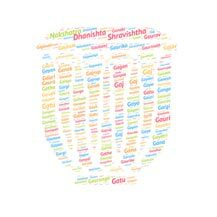 Combination of the names of the Hindu gods Girish means "Lord of mountain"(referring to Shiva) and INDRA. Aviral (Sanskrit अविरल) is an ancient word of Sanskrit origi.. The girl name Shansa is derived from Sanskrit. It means "pra..
Aisha is an Arabic female given name that means "she who liv..
Ranajit (Sanskrit रणजित) is the ancient Sanskrit boy name wh..
Ashriya (Sanskrit: अश्रिया) is a Hindu/Sanskrit Indian popul..